Ambassador Joseph DeTrani has been appointed president of the Intelligence and National Security Alliance (INSA) the organization announced today. In his role, DeTrani will be tasked with raising the non-profit organization’s profile in the intelligence community, as well as increase INSA’s membership and focus on daily operations. He will replace acting INSA president and vice president for Policy Chuck Alsup, who took over the position after former president Ellen McCarthy left to become Chief Operating Officer at the National Geospatial Intelligence Agency (NGA). 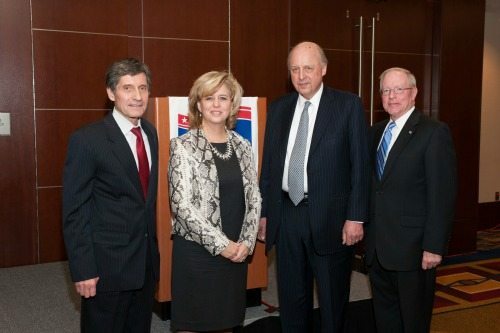 INSA Board Chairman, Ambassador John Negroponte, praised DeTrani’s experience and skills acquired from years of working within the intelligence community and the Department of State. “I look forward to working with him again as we seek to take INSA to new levels of accomplishment,” Negroponte said. With the addition of DeTrani and newly appointed 2013 Board Members, Negroponte looks to strengthen INSA leadership. DeTrani boasts an impressive thirty year public service career. Prior to INSA, the ambassador served in various roles for the Office of the Director of National Intelligence (ODNI). He was the Senior Advisor and North Korea Mission Manager to ODNI, as well as the Director of the National Counter Proliferation Center (NCPC) under ODNI. His specialty in Asia relations led to various roles in the U.S. government. DeTrani served as ambassador to the Special Envoy for Negotiations with North Korea and as the U.S. Representative to the Korea Energy Development Corporation in the State Department. In the past, he has worked in numerous roles for the Central Intelligence Agency (CIA), including Director of East Asia Operations, Director for European Operations, Director of Technical Services, Director of Public Affairs, Director of the Crime and Narcotics Center, and Executive Assistant to the Director of Central Intelligence. Previous ArticleWashingtonExec’s Latest E-Magazine: What’s Trending?